Let’s start with the first book you’ve read. Did that title made you a book lover? O h, I don’t really remember what the first book I ever read was but I do know that reading books was something that has been instilled in me from childhood. My first book very well may have been a nursery rhyme or a fairytale. But I can tell you the first book that introduced Romance to me. It was a translated copy of Victoria Holt’s On the Night of the Seventh Moon. Yes I loved the title of this book enough to go in search of more Victoria Holt books. It sure did make me a Romance novel lover! On your blog page you write that you love reading romance and watching anything that is related to ghosts and haunting. What’s the best romance book and the best ghost movie/series you’ve ever read and watched? I have quite the list of favorite books, mainly under Historical Romance, which is my favorite Romance sub-genre. Lisa Kleypas’s Dreaming of You is one of my all-time favorite Historical Romances. I enjoy reading real life haunting stories. I don’t watch as many movies as I read books, but I do watch some ghost hunting shows. Ghost Adventures is my favorite show. I also enjoyed a very short lived show called The Great British Ghosts. This show was quite fascinating because of the legends and folklore that went with the so-called haunting of an old castle or an even older inn. I wish there were more seasons. Since you’re a huge music lover we’re wondering whether the music influences your book picks or is it just a reading time companion? I don’t choose music based on a book but I have, at times, thought of a certain book while listening to a certain song, and vice versa. I never do both at the same time. For me, it’s either reading or listening to music. Probably my love for reading and writing both. When I joined goodreads for the first time back in 2010, it was simply going to be a place to keep track of my reading. I have written long papers while doing my MA but I never thought about actually becoming a book reviewer. Then I begin writing down my thoughts about the book I was reading in the comments section of goodreads, and this kind of started my interest in book review going. 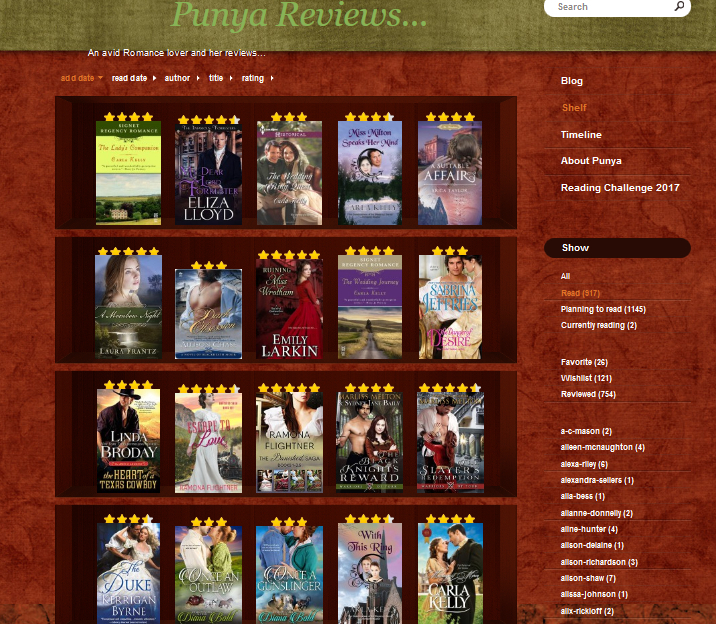 In 2011, my blog Punya Reviews… also started as another place to post my reviews. However, within a year I knew I’d like to continue book blogging as long as I can because I vastly enjoyed the process of talking about a book from my own perspective. Unfortunately, no. I don’t try to read at my workplace because I’m always distracted by this or that and reading, for me, is like meditation. I don’t like distractions when I’m reading. It’s also the reason why I prefer an e-ink reader (kindle paperwhite in my case), rather than a smart phone or devices like that. There are many of those. I generally love the book covers of the Historical Romance published from different publishers; the vibrant colors and the dresses really appeal to me. If I can mention stepbacks, I absolutely LOVE the original stepback of Dreaming of You. I thought this should’ve been the cover! Which books are your most exciting recommendation to your followers? I always recommend books by my favorite authors like Lisa Kleypas or Elizabeth Hoyt or Carla Kelly if they’re a Historical Romance lover like me. Lisa Kleypas’s Wallflowers and Hathaways series or Elizabeth Hoyt’s Maiden Lane series. Carla Kelly has some ah-meh-zing books out there, most traditional regency or Christian-themed but I don’t mind. I recently read A Moonbow Night by Laura Frantz. The narratives in that story were marvelous. The suspense in the end simply blew my mind. Very emotional, as well was a rewarding experience. If you’re going for a little erotically edgy Paranormal Romance, I’d highly recommend Janine Ashbless’s The Book of the Watchers series. I’m yet to finish book 2 cause I’m scared of another long wait until book 3 (waited for book 2 for almost 3yrs). I’m reading that one bit by bit, savoring it. I know, I’m weird like that. There are many authors I can mention here whose works I’ve recently come to admire, like Ramona Flightner, Emily Larkin, Morgan O’Neill, Scottie Barrett (steamy historical romance). The list can go on. At the moment, definitely ebooks! I’m in love with my kindle PW and wouldn’t exchange it for anything the world. I do understand the appeal of paperbacks but ebooks are just too convenient to “carry around”, if I may say so. Three titles for a dessert island? Hmmm, I’ve never given thoughts on DIK books. Still, if I had to choose in a nutshell: Lisa Kleypas’s Dreaming of You, any Carla Kelly title, Scottie Barrett’s Branded. Again I’d like to refer back to Victoria Holt’s On the Night of the Seventh Moon. It got me interested in the Romance genre, inspiring me to explore and discover the many wonderful authors and books that I’ve read in the years since then. Sadly, I don’t have a home library. More specifically nothing that I can actually show off. I don’t own many paperbacks cause I’ve been buying and reading ebooks for a while. For now, that’s where I’m building my library. But I hope to build a home library someday.